I got some new goodies from SU yesterday, so I thought I'd spend some time today playing around with a few of them. This card is for today's Get Sketchy challenge. I used Pumpkin Pie, Bashful Blue, Old Olive, and Real Red for my color palette. I used the new Hostess Level 2 "Wings of Friendship" SU set. I realized that I had not broken out my chalks in quite a while, so I inked the bird stamp with some Versa Mark and used sponge daubers, and blender pens to shade it in. I can tell that this is going to be a versatile stamp and I am looking forward to all the different things I'm going to be able to do with it. The tag at the bottom is from the 4 pack Sizzlits die set "Lots of Tags" also from SU; and also new for me. I was recently pleasantly surprised to learn that I could use the sizzix dies in my Cuttlebug. This is great since I don't have a Big Shot Machine. The button on the flower at the top is from the SU sherbet collection. I have a lot more new goodies to play with which I'm going to try to do over the weekend. For now, that's all for me though. Have a great weekend and thanks for stopping by! Have fun with all your new goodies. 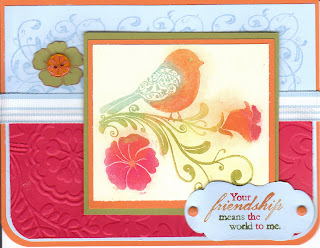 This is really pretty, I like the colors and that embossing is great.